Was founded by uniting the two towns of Garmisch and Partenkirchen by a decree of Adolf Hitler to bring the 1936 Winter Olympics to Germany. The International Olympic Committee was going to pass over Germany as the host because there were not enough hotel rooms in the host town. So Hitler forced the unification of Garmisch and Partenkirchen to create a larger town, which would be more appealing to the IOC. Garmisch-Partenkirchen is one of Germany’s premier tourist ski towns. And offers tremendous hiking, skiing and biking opportunities. It lies a few kilometers from the Austrian border. Garmisch-Partenkirchen, when people in Germany think of it. The first thing that springs to mind is winter sports. Seven months of snow, 60 kilometers of pistes. Pristine slopes and Germany’s only glacial ski area. The resort offers the very best conditions for winter sports enthusiasts. There are slopes suitable for skiers of all abilities. And the region has become a hot spot for international snowboarders and freeriders. Olympic venues. Don’t forget, that this picturesque town is also a first-class climatic health resort throughout the year. The perfect place to unwind, pamper yourself and enjoy life’s little pleasures. Also, On top of Germany: Mount Zugspitze. At 2,962 meters. 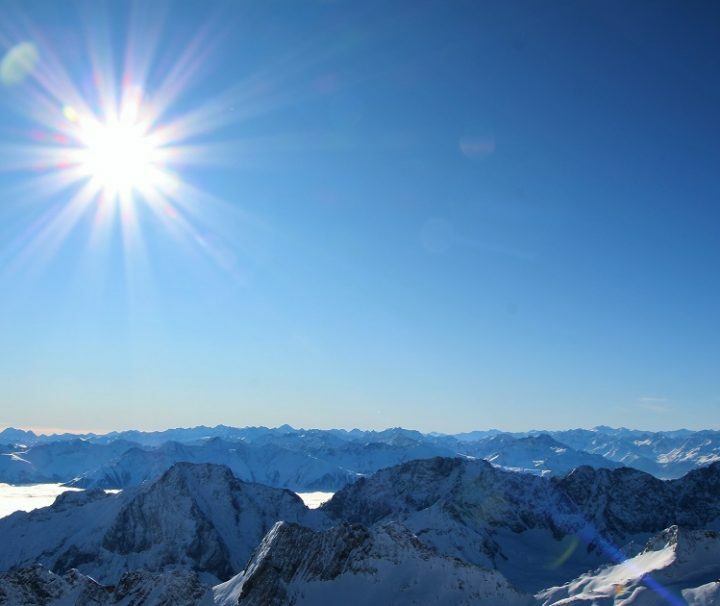 The Zugspitze is Germany’s highest peak and a fabulous destination for nature lovers, sun worshippers, walkers, and skiers. When you reach the top, a breathtaking vista across the Alps unfolds before you.